Aye, I get what yer sayin’, but let me tell ye right to yer stinkin’ face, a pirate need no executive assistant. Arrrggg! Sorry about that, I be arguin’ with me first mate as he be tellin’ me that I need to organize me stuff better what with 3 cargo holds now filled up with various trinkets and 1 cargo hold full o’ British captives. The funny thing is that me first mate doesn’t know that I be gettin’ things done already with me new app, Executive Assistant +. It is an all-in-one assistant app that pretty much organizes everything ye need on your Android phone. Here is me detailed review of the app. Appventive is the maker and Executive Assistant + is the name of the app. And from that foretelling name itself, you can easily guess what kind of app it is – it is a task management app that pretty much doubles and do-it-all app. 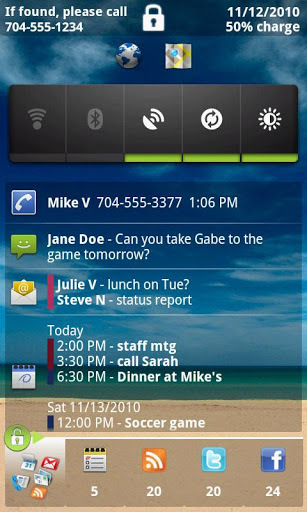 It integrates to everything – from your basic email to your phone functions, be it text messaging or missed calls. Frankly speaking, with Executive Assistant +, you probably won’t need to use the Android native system to operate your phone. Everything can be done right on the app. Don’t believe me? Read on. The main strength of Executive Assistant + is in its information handling. It’s most basic function is to organize and alert you when something is up, whether it is a new text message, a missed call, an email sent to your Gmail account, or just a simple message sent to you via GTalk or Google Voice. Executive Assistant + will show you everything you need on its interface, sometimes even without having to unlock your phone. Currently, app has 4 information modes delivered by a widget interface. The first is the locked screen widget. Basically, Executive Assistant + will show everything you need to know on your screen while it is unlocked. The second mode is the Welcome Screen mode where once you unlock the phone, the app pops up notifying you of a scheduled meeting, a missed call, or a scheduled text message you need to send. The other two modes are the Home Screen and the Locked Screen widgets. These widgets only take up a small area of your screen whether it is on the home screen or on the locked screen. 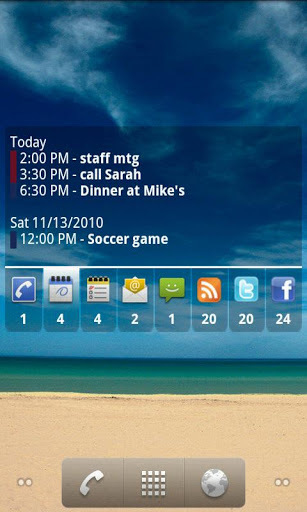 Executive Assistant + also comes with full integration to social networks like Facebook, Google+, and Twitter. So, if you configure it right, you can have all 3 feeds working on any of the 4 modes. This makes tracking every tweet and status update within your social network and sphere of influence much easier. Need to reply to a text message, send out a GTalk shout out to a friend, call back the person that left you a voice message or missed call? There is no need to access the native Android phone interface in order to do those. The app seamlessly integrates with it so that you can do those tasks through the app as opposed to navigating the maze that is Android. Even email reading and sending is easy to tackle on this app as it also fully interacts with pretty much any popular POP or IMAP client. Even exchange clients like TouchDown and Enhanced Email are supported. Executive Assistant + is one of the most robust task management apps around. No other app in the market right now can sync and link every single data on your phone, email, and social media accounts into a single interface that is easy to access and use. The design of the interface may be a bit dated but it still delivers the punch. Unfortunately, there is a bit of hefty price tag for the app at $6.99. Yet, with so many features in the app, it seems to still be a veritable steal. This dusty old Pirate sure manages it’s crew much better nowadays, savvy? Also worth mentioned is that it integrates very well with the MetaWatch smartwatch! Notifications and unread count widgets right on the watch.